Microdermabrasion is a non surgical skin rejuvenation procedure that uses mechanical abrasion combined with suction to remove dead skin cells from the skin. Suction also stimulates blood circulation and self rejuvenation. A vacuum attaches the tool to the skin so the therapist does not need to apply any pressure. It is like polishing the skin. 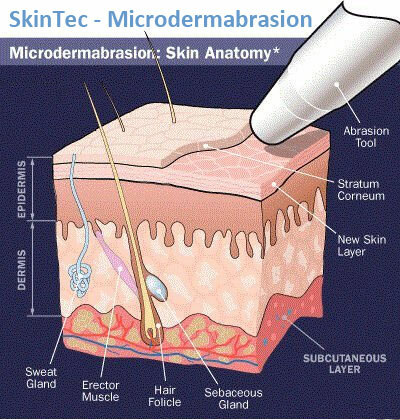 Microdermabrasion has two major therapeutic effects on the skin. Firstly it gently removes the dead cells from the epidermis (outermost layer of the skin) using fine crystals or diamond. This greatly improves the skin turnover rate, allowing new, fresh skin cells to appear. This improves the skin tone and refines the texture. Secondly, in addition to exfoliation, Microdermabrasion also provides a firm suction to the skin’s surface that not only clears the pores (especially important for acne sufferers) but also improves the blood supply to the dermis thereby enhancing cellular nutrition. In fact, regular treatments have been clinically shown to enhance the production of collagen and elastin in the dermis thereby reducing fine lines and wrinkles and improving the skin’s elasticity and resilience. The number of treatments needed depends on the severity of your skin condition.